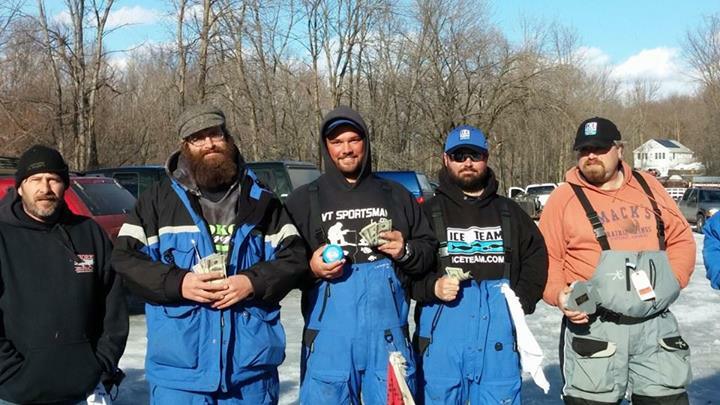 The final leg of the VSHTS was today at Laphams Bay on southern Lake Champlain. Today was about the points championship and Dylan had a slight lead over the rest of the field. He was feeling the pressure for sure. Reports of fish in the area were encouraging for the field of 38. You could find fish throughout the bay scattered but the fishermen seemed to focus in on two key areas. It was sure to be a shootout in close quarters. Walking conditions were difficult for us short legged people at the start as we made our way out to our fishing spots. The plan for the day was to set up shop in our Clam shacks and see what we could do sight fishing. The water to start was fairly clear, and fishing 5 feet of water or less seemed to be the go to method for most anglers. Bobby’s first drop of the day produced a short black crappie but that was pretty much it. Dylan made a major move to an area he had pre-fished the day before while Bobby stayed put and cut a few more holes working back towards the launch. With Dylan’s move he also changed his game plan for the most part. He decided to fish outside of his shack in hopes of fishing a few more holes searching out the aggressive fish. By 10 am Dylan had connected on a decent limit and was now looking to upgrade, Bobby on the other had was struggling again yet to catch a keeper crappie. By the end of the day however Bobby was able to put two decent crappie, a perch and three gills in his bucket for the weigh in. From what we had heard it was going to be close at the weigh in in terms of the points. Close was an understatement, Dylan was able to hold onto his lead and edge out first place by three one hundredths of an pound. This solidified Dylan’s points chanpionship for the 2014 VSHTS! Way to go Dylan. Bobby was able to have a decent season as he came in 8th place in total points for the four events. Can’t wait for next season.